Other stats include 2008 - 2019 Each Year Prices for Gas, Movie Ticket, First Class Stamp, College Tuition, Wrangler Jeans, Average House Rent, Average House Purchase, KW/Hr Electric, Wages, Unemployment Percentage, Fed Base Rate Percentage, Dow Jones, Inflation US Gov, CPI US Gov, Gold per Ounce. Check Out our Just updated music section with additional information and mobile friendly pages Find more on our History of Popular MusicFrom 1920's to 2000's page. Jazz and blues represented popular music in the 1920s as the newly hatched recording industry found its footing. The Thirties saw the popularity of Big Band and Swing music provide an upbeat contrast to the Great Depression which continued into the 1940s during World War II. Rock n' Roll music emerged in the 1950s and teenage culture developed with Elvis Presley and other rock idols providing inspiration. The Sixties featured psychedelic rock, folk music, R&B, and the British Invasion with the Beatles and Rolling Stones commanding attention. In the 1970s, the dichotomy of Disco and Hard Rock made up the music scene. During the Eighties, the Music Television (MTV) cable network was launched and had a profound impact on popular culture at the time, turning musicians into pop stars and global celebrities on a much larger scale. Grunge, hip-hop, and manufactured pop music were popular during the 1990s. In the 2000s, dance music, rap, and indie bands dominated the airwaves. With the creation of the United States just prior to the turn of the century (the U.S. Constitution became effective in 1791), the 1800s saw much of the modern Western world establish itself. During the beginning of the 1800s many nations were created within areas of the "New World" and Africa was continually colonized. The U.S. doubled its size in 1803 with the Louisiana Purchase, and by the early to mid-1800s the development of the steam engine became the catalyst for the Industrial Revolution. Civil War broke out in the United States in the middle of the 1800s, it ended in 1865 with the abolition of slavery. The discovery of new fuel sources like petroleum and electricity kicked industrialization into high-gear. 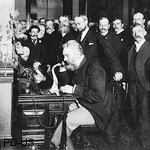 By the end of the century, advances in communications with the creation of the telephone meant that the world was becoming increasingly connected. Find more on our 1800s page. During the 1900s and 1910s the shift to an industrial society was nearly complete as factory work became the norm and the agrarian economy became more reliant machines. With Henry Ford's introduction of the assembly line in 1913, productivity increased and improved pay, benefits, and working conditions created an expanding middle class. Mass manufacturing of consumer goods transformed the way people lived their lives and more leisure time meant that the consumption of entertainment increased. The newly invented automobile and newly developed mass transportation systems like subways, trams, and rail, meant that traveling became easier. The advancement of industry and technology, while improving the lives of many, also paved the way for mass destruction as illustrated during World War I. The a global conflict was the deadliest in modern history up until that point. Find more on our 1900s page and our 1910s page. At the end of the First World War, the well-intentioned League of Nations was established in 1920, and the aggressors of the war, particularly Germany, were punished with steep reparations. The aftermath of the war led to an unstable and economically struggling Europe, causing countries like Germany and Italy to turn to nationalism and fascism and countries like England and France and the U.S. to turn to isolationism. In the U.S., for much of the decade, the economy boomed, Jazz music was popular, the prohibition of alcohol (18th Amendment in 1920) created an underground economy ruled by gangsters, and women who had just received the right to vote (19th Amendment ratified in 1920) emulated the freedom-loving Flapper girl. The 1920s also marked a decade full of huge advances in flight technology with Charles Lindbergh completing the first non-stop transatlantic flight from New York to Paris in 1927. Around the rest of the globe, Communism spread throughout the Soviet Union and China, which also led to civil war. In October of 1929, the U.S. Stock Market crashed, quickly spiraling the U.S. economy into the Great Depression, joining much of the rest of the world that had already been plunged into economic chaos. Find more on our 1920s page. The 1930s began with the Great Depression and ended with the start of World War II. The U.S. elected Franklin D. Roosevelt as the President in 1932 and throughout the decade his administration implemented many socialist reforms, known as the New Deal, to help bring the nation out of the depression. Prohibition ended in 1933 with the ratification of the 21st Amendment. 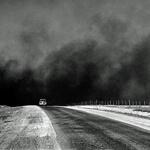 Poor farming practices and a massive drought caused the "Dust Bowl" in the Great Plains states. In Europe, Nazi Germany rose to power as Hitler appointed himself Furher in 1933, marking the beginning of the Holocaust. As a result, millions of Jewish people and political opponents were interned and murdered. During the decade Spain also fell to authoritarianism as General Francisco Franco became dictator of the nation after their civil war. Japan amped up its aggression in the East, invading China in 1937. Germany became outwardly aggressive as well, continually violating the terms of the Treaty of Versailles, annexing Austria in 1938 and invading Poland in 1939. The invasion of Poland marked the beginning of World War II as Great Britain and France declared war on Germany in response. Find more on our 1930s page. Most of this decade was occupied by World War II, Nazi Germany quickly invaded Western Europe gaining control over France in 1940 and began air strikes against Great Britain. Germany joined with Italy and Japan to form the Axis Powers and began its ultimately unsuccessful invasion of the Soviet Union in 1941. Japan attacked Pearl Harbor, bringing the United States into the war and by 1944 Allied forces successfully stormed the beaches of Normandy, France, turning the tide in favor of the Allies. The Allies quickly liberated Nazi-occupied Europe and the Soviet Union pushed back from the East. By May of 1945, Adolf Hitler committed suicide and Germany surrendered. The U.S. continued to fight Japan in the Pacific until August of 1945 when the use of 2 newly developed nuclear bombs forced Japan's surrender. The remainder of the decade was marked by the establishment of the United Nations in 1946 and war crimes trials for leaders in the Axis powers to answer for their crimes against humanity. The United States emerged from the war as a world power and placed itself opposite the Soviet Union, in doing so beginning a decades-long ideological conflict with the U.S.S.R. known as the Cold War starting circa 1947. The era of computing also began during this decade with the creation of the first programmable computer (ENIAC) in 1946 and the invention of the transistor in 1947. By the end of the decade the People's Republic of China was proclaimed under Mao Zedong, creating a large Communist ally for the Soviet Union as the Cold War amped up. Find more on our 1940s page. The Cold War and the Baby Boom dominated the Fifties. The United States developed the first hydrogen bomb in 1952 and the Soviet Union made theirs in 1953, accelerating the nuclear arms race. The Korean War erupted in 1950 as Communist North Korean forces (backed by China and the Soviet Union) fought against South Korean forces (backed by the U.S. and United Nations) and was the first major conflict during the Cold War. The U.S. experienced an economic boom following WWII and consumerism became integral to American society. Several scientific discoveries improved the lives of many with the discovery of the DNA Double Helix and the creation of Salk's Polio Vaccine in 1953. The Civil Rights movement also began in this decade, the 1954 Brown v. Board of Education Supreme Court case declared racial segregation in public schools as unconstitutional, paving the way for integration. In 1955, the Montgomery Bus Boycott began after the arrest of Rosa Parks and was led by Dr. Martin Luther King Jr., it ended in 1956 after securing another important Supreme Court win. Near the end of the decade the Space Race began as the Soviet Union launched the first artificial satellite with Sputnik 1 in 1957 and in 1958 the U.S. created NASA. Find more on our 1950s page. The 1960s were a time of great societal upheaval and political uncertainty. In 1960, John F. Kennedy was elected as the U.S. President and represented a hopeful future for many. Cold War tensions rose early in the decade with the Cuban Missile Crisis in 1962, bringing the world to the brink of nuclear war. JFK was assassinated in 1963 and was succeeded by Lyndon B. Johnson. Under LBJ, the Vietnam War was escalated and anti-war protests sprang up across the country. Dr. Martin Luther King, Jr. became a national figure of the Civil Rights Movement, delivering his famous "I Have A Dream" speech in 1963. Much progress was made for Civil Rights with the passage of the Civil Rights Act of 1964, the 1965 Voting Rights Act, appointment of Thurgood Marshall to the Supreme Court in 1967, and the Civil Rights Act of 1968. The Space Race brought huge scientific advances throughout the decade with the USSR putting the first human Yuri Gagarin, in space in 1961 and it came to a dramatic end in 1969 with the U.S. successfully landing a man on the Moon for the first time. Find more on our 1960s page. The Watergate Scandal began in 1972 exposing corruption within the top levels of the U.S. government and leading to the resignation of President Nixon in 1974 who was facing almost certain impeachment. The Personal Computer had its start during this decade as the microprocessor was created in 1971, Microsoft (1975) and Apple (1976) companies were created, and the first PCs were sold to retail consumers. At the outset of the 1970s the United States was still heavily involved in the Vietnam War and had invaded Cambodia in 1970, prompting an outpouring of anti-war demonstrations. By 1975 the United States had pulled out of Vietnam. In 1973 OAPEC (Organization of Arab Petroleum Exporting Countries) placed an oil embargo on the United States leading to fuel shortages and inflation and although the embargo ended in 1974, its effects permeated much of the rest of the decade. The 1973 Arab-Israeli War between Egypt, Syria, and Israel served as a Cold War proxy conflict with the Soviet Union on the side of the Arab nations and the United States behind Israel. Through diplomatic efforts, conflict in the Middle East cooled down throughout the late 1970s and in 1975 Egypt re-opened the Suez Canal after 8 years of blockade. In 1978 the Camp David Accords were signing, creating a framework for peace between Egypt and Israel and in 1979 a peace treaty was signed, ending three decades of conflict between the two sides. Find more on our 1970s page. In the 1980s the Cold War tensions were at their highest at the beginning of the decade, but, by the end of the decade tensions had waned as the collapse of the Soviet Union seemed imminent. Ronald Reagan was elected as the U.S. President in 1980 and had taken a hard stance against the Soviet Union, increasing tensions and leading to symbolic gestures such as the mutual boycotts of the 1980 Moscow Olympics and 1984 Los Angeles Olympics. 1989 saw the collapse of the Berlin Wall which was the beginning of the end of the Cold War. In 1981 the AIDS virus was identified as it became a global health crisis and much of the decade was spent researching the new illness and developing methods to treat it. Technology continued to advance at a more rapid pace as computers became more common and more advanced. The mobile phone was introduced in 1983 and a new generation of portable technology emerged. In 1986, the Soviet Union experienced one of the largest nuclear disasters at the time at the Chernobyl Nuclear Power Plant in Ukraine, an incident which prompted several nations around the world take steps to improve safety in their nuclear power plants or to phase out nuclear power completely. Find more on our 1980s page. The 1990s, as in several previous decades, was marked by even more rapid advancements in technology than the decade before it. In 1990, Tim Berners-Lee proposed the World Wide Web, laying the foundation for the Internet as we know it, and in 1991 the Internet was made available for unrestricted commercial use. As the decade went on, the Internet became a larger and more users logged on, connecting across the globe to share in information and ideas. In 1998, the search engine "Google" was founded and has since became a dominating force in the online world. The Cold War officially ended and in 1991 the Soviet Union was dissolved. Bill Clinton was elected as the U.S. President in 1992. Trends in favor of globalization led to developments like the creation of the European Union in 1993 with the Treaty of Maastricht, the 1994 NAFTA (North American Free Trade Agreement), and the 1995, the creation of the World Trade Organization. The study and use of DNA became a huge topic during the decade and the Human Genome Project began mapping human DNA in 1990. Debates erupted over cloning, genetic modification, and stem cell research throughout the decade and in 1997 Dolly the Sheep, the first successfully cloned mammal, was revealed to the world. Find more on our 1990s page. The September 11th, 2001 terror attacks against the United States set the tone for the 2000s. The U.S. entered multiple conflicts in the "War on Terror" beginning in 2001 with the invasion of Afghanistan and again in 2003 with the Iraq War. In an effort to fight against climate change and high fuel prices hybrid vehicles became mainstream as more companies started producing them. Handheld technology became smaller and more powerful, mobile phones became ubiquitous, and in the middle of the decade the Smart Phone was created (most notably the iPhone in 2007) allowing people to carry what amounted to a small computer with internet access around with them at all times. The development of "Social Media" was also influential during this decade with the popularity of social sharing websites like Myspace (2003), Facebook (2004), YouTube (2005), and Twitter (2006). Several large notable natural and man-made disasters devastated the decade with the Indian Ocean earthquake and tsunami (2004), Hurricane Katrina (2005), and Sichuan earthquake (2008). As a global financial crisis loomed, in 2008, the United States made history electing Barack Obama as the first African-American President of the United States. The decade ended with the 2008 financial crisis, causing a recession as the housing bubble, auto industry, and banking system collapsed in the U.S. and several other developed nations around the world. Find more on our 2000s page. Find hundreds of fashion images from the 1920s to the 2000s in our clothes and accessories page. Check out how fashion has changed in the past 100 years from flapper styles in the 1920s, Hollywood glamour of the 1930s, work clothes for the 1940s, excessive dresses from the 1950s, mini skirts of the 1960s, 1970s disco glitz, colorful and bold styles of the 1980s, and 1990s sporty fashion. Pages feature style descriptions and original prices, historical context, and a variety of items including womens, childrens, mens, accessories, shoes, and hats. Find more on our Fashions page. Simple wood toys and dolls proved popular in the 1920s and mass-produced toys like die-cast cars emerged. Comic books became widely available in the Thirties and many still-popular board games were invented during the decade. In the 1940s, industrial accidents created the best toys with the Slinky and Silly Putty being created during the War when other materials were being developed. Consumerism boomed in the 1950s and the Baby Boom meant more toy purchases than before, Barbie Dolls, Frisbees, Mr. Potato Head, and other classic favorites were first created during the decade. As television became more widespread, cars based on childrens' cartoons emerged in the 1960s. The first widely popular and successful video game, PONG, was released in the Seventies starting off the craze of digital entertainment. In the 1980s, the hunt for new toys was mass undertaking and the first mass hysteria for a product came in 1983 with the Cabbage Patch Doll. Popular toys from the 1990s included the collectible Beanie Babies and portable digital games like the GameBoy were also a must-have for kids. On our toy pages we have brief overviews for each decade and have many toy images, descriptions, and prices from when they were originally sold. Find more on our Toys page. Take a look at our Modern History Quiz pages where you can test your knowledge on world history events from before the 1920s to the 2000s. We also have some specialty quizzes featuring Sports, TV and Movies, Prices, and more! Find more on our Modern History Quizzes page. Our Sports History pages feature in-depth information about the creation of our favorite past times. We detail the changes from the inception of certain sports to the modern incarnation and take note of political influences, entertainment purposes, and much more. We have overviews of all types of different activities and more detailed pages on Baseball, Basketball, Football, Ice Hockey, Soccer, and Golf. Find more on our Sports page.